After nearly a year of preparation, translating, and illustrating, Starfysh is excited to announce the release of our first book, An Nou Li (Let’s Read! ), an early childhood reader. 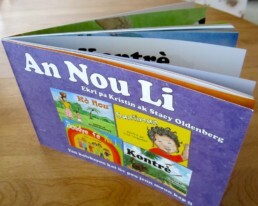 Written by Stacy and Kristin Oldenburg, the book is really a compilation of four smaller books: Kò Nou (Our Bodies), Santiman (Feelings), Kontrè (Opposites), and Bondye fè Koulè (God Made Colors). 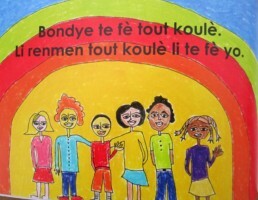 Each page is professionally illustrated with vivid pictures young Haitian children will love. “Our vision,” says Stacy, “is not only to provide tools to Haitian teachers to help them teach reading, but to instill in Haitian children a passion for learning that will follow them for their entire lives.” A second book, a 2nd/3rd grade level reader, is currently in the translation phase and should be out in the Fall.